MOSHE (AUS) (Bay or Brown 2007-Stud 2012). 3 wins at 1000m, 4th ATC Fireball H., L. Brother to SW Black Caviar. Sire of 158 rnrs, 81 wnrs, inc. SW Moshki (SAJC Cinderella S., L), SP Feng Chu - Big Fortune (H.K. ), El Venetian, Moshway and of Chevite, Sheer Madness, Bord de Gain, Gala Moshea, Irish Moshe, Tattybogler, Huge Action, Moschard, Typhoon Rubi, A Little Chunky, Aljazmic, Black Mosheen, If You Will, Miss Dominance, Mosh Opera, etc. Northern Divine (f. by Moshe). 2 wins. See below. Affectation (g. by Shinzig). Winner at 1600m in Aust. Shinsami (f. by Shinzig). Placed to 2016-17 in Aust. Tulssami. 3 wins. See above. BOURBON AND ICE (Whiskey Road). 8 wins from 1200m to 1600m, A$169,415, VATC Autumn Sprint H., L, VRC Food & Wine Festival H., Rodney Johnson H., Bargain Box Welter H., VATC Taylors College P., MVRC Parkville H., 2d VATC Victoria H., Gr.3, VRC Shamrock Travel H., VATC Open Learning P., Resolute H., 3d VATC Resolute Welter H.
Carolina Moon. 6 wins to 1400m, A$126,000, VATC Autumn Country Cup, 2d VRC Melbourne Food & Wine Festival P., VATC Australian Racing Museum H., Hydrogen H., 3d BTC Vitalcall H.
Inch Ahead. 6 wins from 1000m to 1800m, TRC Tascall Optus H.
Musical Maestro. 4 wins from 1000m to 1650m, WATC Washington H.
Powerful Light (Falvelon). 2 wins at 2, A$78,800, BTC Concept Window Fashions H., 3d QTC CE McDougall S., L. Producer. MUSICAL SCULPTOR (Arch Sculptor). 3 wins. See above. Success Trend (Godswalk). Winner at 1400m, 3d HKJC Kukri Trophy, L.
AEROBICS (Snaadee). 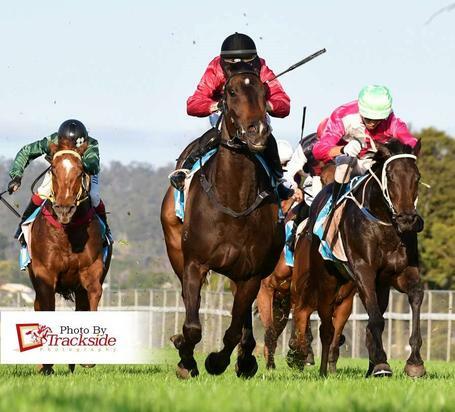 5 wins-1 at 2-from 1100m to 2200m, TRC Hobart Guineas, L, TTC Clemons 2YO H., TRC Sir Tristram Trophy, RMC Valves H., Southcorp Wines H., 2d TRC Strutt S., L, KR Pearce H., TTC Andrew Thomas & Mallinson Pty Ltd H., 3d TTC Launceston Mitsubishi H. Producer. GREAT CRUSADER (Our Maizcay). 8 wins-4 at 2-to 1200m, A$423,625, STC Todman Slipper Trial S., Gr.2, BTC City Rowers H., GCTC Magic Millions 2YO Superbowl Final, BTC Brisbane Marriott Hotel Freshman 2YO H., Jupiters Gaming Flying H., Allan Campbell Memorial H., Horses Birthday H., Qld Tatt's RC Parcel Post 2YO H., 2d BTC Eric Kirwan 2YO H., Moraitis Flying H., Bin 555s H., 3d QTC Lightning H., L, GCTC Marina Mirage WFA Sprint S., BTC Transcontinental Hotel H., Churchie H., 4th BTC Summer S., Gr.3. BENNY'S BUTTONS (Refuse to Bend). 5 wins-1 at 2-to 1350m, A$498,100, BRC Vo Rogue P., Gr.3, Ascend Sales Dash H., Channel Seven H., Silky Smooth & Speedy H., 2d BRC Queensland Guineas, Gr.2, BRC Sprint H., Gr.3, Lough Neagh S., L, Keith Noud H., L, Hinkler H., L, Qld Tatt's RC Australia Post S., L, Sunshine Coast Cup, L, Qld Tatt's RC Hardy Brothers Jewellers H., BRC Gallopers $11.95 Meals H., Ticketek H., Gold Coast S., BRC Brc.com.au 2YO P., 3d BRC Daybreak Lover S., L, Ascot H., L, GCTC Prime Minister's Cup, L, Sunshine Coast Guineas, L.
REAL SURREAL (Real Saga). 4 wins-3 at 2-to 1350m, A$1,733,750, GCTC Magic Millions 2YO Classic, RL, Ipswich TC Gai Waterhouse Classic, L, BRC Broncos 2YO H., Sirromet Love Sparkling 2YO H., 2d ATC Surround S., Gr.2, BRC Just Now H., L, 3d BRC New Sky Racing Iphone App 2YO H., 4th ATC Light Fingers S., Gr.2, BRC Bright Shadow H., L.
Race Record: 23 Starts 2-3-6 A$46,800. 2 wins at 1200m, 1400m to 2018-19, 2d BRC Doomben Ten Thousand P.